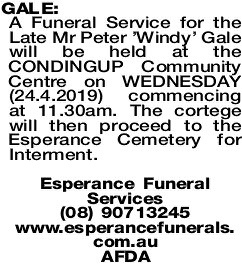 A Funeral Service for the Late Mr Peter 'Windy' Gale will be held at the CONDINGUP Community Centre on WEDNESDAY (24.4.2019) commencing at 11.30am. The cortege will then proceed to the Esperance Cemetery for Interment. 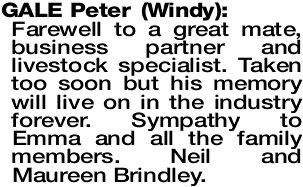 We are overwhelmed by the tragic passing of Peter (Windy). 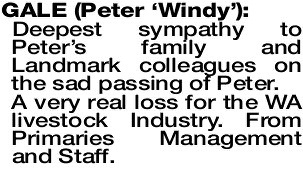 Peter was a loyal and highly respected colleague, friend and mate to many in the Landmark family and he will be missed immensely. 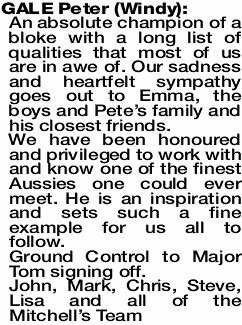 Our heartfelt sympathy to Emma and Peter's family, we share your sorrow at this difficult time. 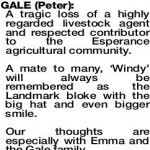 GALE PETER Our Heartfelt sympathy to Emma, all family members and Landmark colleagues. 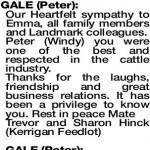 Peter (Windy) you were one of the best and respected in the cattle industry. 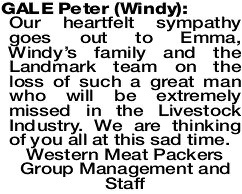 On behalf of the West Australian Lot Feeders Assoc, our deepest sympathy to Emma, Family Members and Landmark Colleagues. 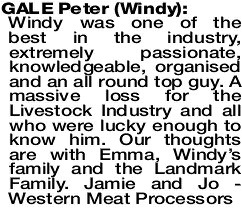 Peter (Windy) was a great supporter of our organisation and respected by everyone for his knowledge and passion for the Cattle Industry WALFA. 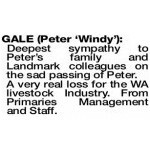 GALE PETER ‘WINDY' Deepest sympathy to Peter's family and Landmark colleagues on the sad passing of Peter. An absolute champion of a bloke with a long list of qualities that most of us are in awe of. 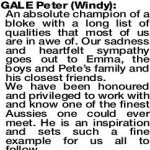 Our sadness and heartfelt sympathy goes out to Emma, the boys and Pete's family and his closest friends. We have been honoured and privileged to work with and know one of the finest Aussies one could ever meet. He is an inspiration and sets such a fine example for us all to follow. Ground Control to Major Tom signing off. 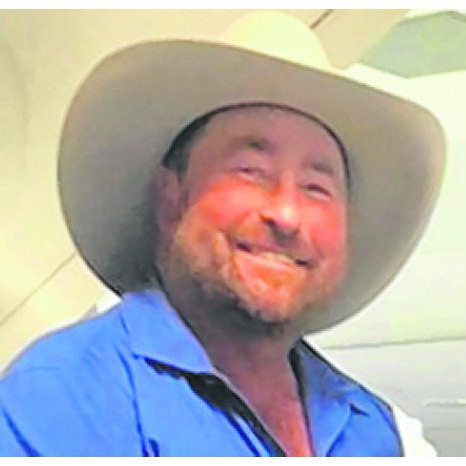 A tragic loss of a highly regarded livestock agent and respected contributor to the Esperance agricultural community. 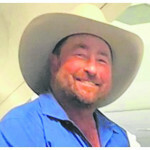 A mate to many, ‘Windy' will always be remembered as the Landmark bloke with the big hat and even bigger smile. 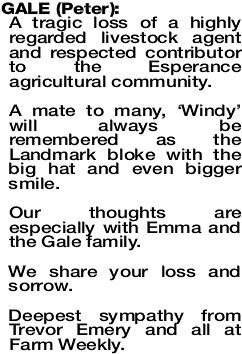 Our thoughts are especially with Emma and the Gale family. We share your loss and sorrow. 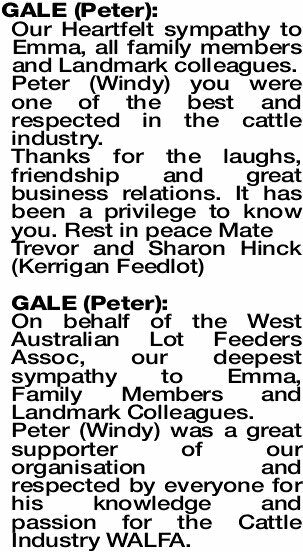 Deepest sympathy from Trevor Emery and all at Farm Weekly. 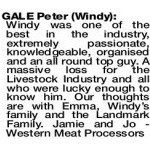 GALE PETER Shocked to hear of the passing of Windy Gale. 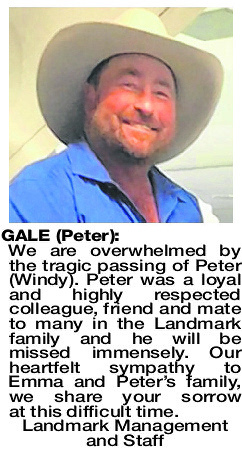 GALE PETER A terrific man taken too soon, you will be missed mate. Greg, Peta Jones and families. 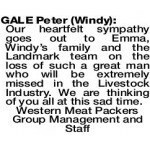 GALE Peter WINDY Our heartfelt sympathy goes out to Emma, Windy's family and the Landmark team on the loss of such a great man who will be extremely missed in the Livestock Industry. We are thinking of you all at this sad time. 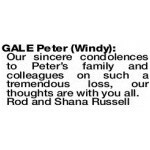 GALE Peter WINDY Our sincere condolences to Peter's family and colleagues on such a tremendous loss, our thoughts are with you all. 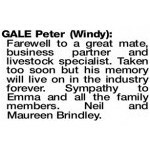 Farewell to a great mate, business partner and livestock specialist. Taken too soon but his memory will live on in the industry forever. Sympathy to Emma and all the family members. Neil and Maureen Brindley.